1. The April 2000 issue of Scale Aircraft Modelling (v.22,no.2) contains an 'Aircraft in Detail' feature entitled 'SFOR Helicopters in Bosnia'. 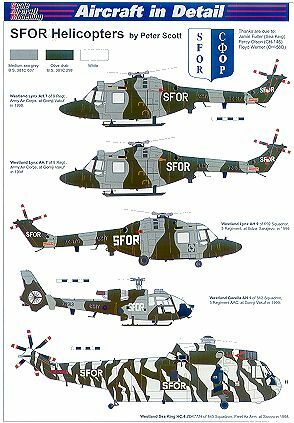 Mark Attrill describes the SFOR organisation and the helicopter types used over this war-torn area of Europe, and includes a list of recommended kits in 1:72 and 1:48, while Peter Scott illustrates their colours and markings. 2. The April edition of Internet Modeller includes a review of the 1:72 Italeri A129 Mangusta written by Chris Bucholtz. These are expected to be out before the end of this year, maybe sooner. 4. Pascal Cholin has scanned 30 plus close-up pictures of an AB-47G which he took at his local airfield. These will soon appear at the Aircraft Resource Center, courtesy of the 'Three Amigos'. 5. 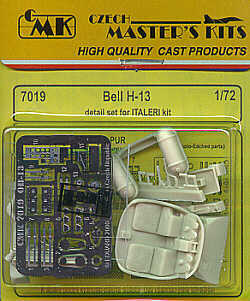 Czech Master Kits have released their 1:72 detail set #7019 for the Italeri Bell H-13. This appears to contain an etched sheet, acetate instrument dials, and a number of replacement resin parts including a two-seat cockpit, fuel tanks, etc. 6. Released recently were two Eduard etched detail sets; #72317 for the interior of the Italeri/Revell H-21, and #48309 for the Italeri OH-13 Sioux. 7. Eduard are also about to release a set of canopy & wheel masks for the H-21, #XS-051. 8. If anyone wants to know how to make their own photo-etched parts at home, using relatively cheap supplies, take a look at this how-to article. 9. AeroCalcas Argentinas decal sheet #72005 includes markings for a blue Argentine Navy S-55, serial 4-H-12, along with a Skyhawk and a Catalina. Thanks to Pete Tasker, Pascal Cholin, Dave Roof, and Ward Shrake.